I sat down at our small kitchen table and explained, “You don’t see anything because I covered it with that old army blanket. Now promise me you won’t go out and…” She jumped up from reading her cookbook and dashed for the door. Being closer than I was, she escaped easily. By the time I got to the door, she was throwing the blanket back. I hollered to no avail, “Tomorrow’s your birthday!” Without looking at me, Norma said, “So… ?” And then she screamed, “A drywasher! Let’s go try it out.” When I reached the truck I said, “Let’s at least wait ’til after lunch.” She was running around grabbing shovels and buckets and said, “I’m not hungry.” God knows that wasn’t true–she’s always hungry! From that seemingly innocent Christmas gift, our lives changed dramatically. Originally, after spending a summer dredging, we traveled to Quartzsite, Arizona to sell our gold and gold jewelry at swap meets on the weekends. This normally inconspicuous little town with RV parks and BLM open desert camping, just east of the California border on Interstate 10, balloons from a few thousand permanent residents to well over half a million people during the winter! It has a real circus atmosphere, the main attraction being the rock and mineral displays at a multitude of swap meets and shows. In the midst of all this are airplane rides, balloon and buggy rides, side shows, live music, antique sales, and perhaps a little junk. And let’s not forget the food vendors, guaranteed to satisfy any craving (except Norma’s). We came to sell our gold, we saw what was going on, and we stayed. Shortly thereafter, we claimed 20 acres in the foothills, seven miles south-west of town. That was14 years ago. This is where we still dry-camp and dry-wash for gold during the winter months. It’s R and R (rest and relaxation). Our first dry-washer was gas-powered and larger than I cared for. It did a great job, but after dredging all summer, I needed a reprieve from hard physical work. After all, I was in my fifties. Remember that classic Lucille Ball routine where she and Ethel Mertz worked on a conveyor belt packing chocolates, and couldn’t keep up? That’s how I felt with that large dry-washer. One day, right after dry-washing, I was sitting in our truck, exhausted. I started the truck and I remember Norma hollering, “Stop! You’re going to run right over the dry-washer!” I think I was subconsciously trying to destroy it. “Let’s sell it,” Norma said, “while we still have one to sell.” We traded it for a gold spinner the next day. It was a few years later when I bought the inexpensive, hand-operated dry-washer, which brings me back to Norma pulling the blanket off of it. So we started and took turns operating the handle and shoveling into the dry-washer. The person pumping the handle sat on an upside-down 5-gallon bucket, and took in the scenery; it was a cushy job. After a few bites of her sandwich, Norma pointed and said, “That looks like jade.” She slid down about 15 feet and knelt to dig, the best she could do with a sandwich in one hand. She stood up to talk to me and spooked a doe, which immediately bounded away, leaving a yearling frozen in its tracks. The doe turned and squealed. The baby bounded down the hill awkwardly, and they happily reunited. It was an unequaled thrill. We finished lunch and continued dry-washing. 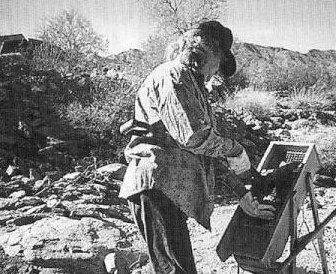 When we reached the caliche, Norma told me a guy with a red scraggly beard had told her to take a lot of time brushing the hard surface, making sure it was absolutely clean, as the gold stops there. He did find more gold than most, so we decided to give the caliche a good cleaning. We put the “brushings” thr through the dry-washer and decided to clean-up. We had dry-washed for only an hour, but were anxious to see how we were doing. I walked to her and there it was–a beautiful, bright gold nugget, contrasted against the green gold pan. It was jagged and rough, not river-worn like we were accustomed to. As we finished panning, it began to rain. We knew we couldn’t dry-wash when the ground was wet, so we grabbed a plastic tarp, drove out to the claim, and covered the area where we had found the nugget. It takes a lot of rain to really soak up an area, so a tarp usually does the job. 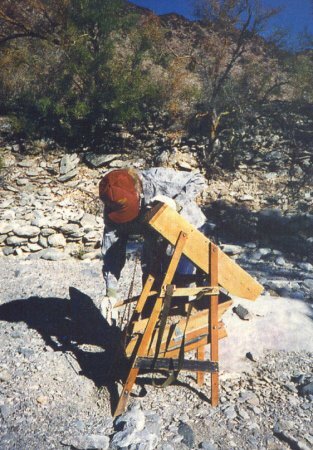 Reflecting back on those first years with our dry-washer, we also followed a tip from a guy called “The Professor,” and started taking a tub and water out to the claim with us so we could pan out on site. We’d dry-wash, have a picnic, and pan right there. Life doesn’t get any better than that! What this is all leading to is that we’ve learned by watching, listening, and then doing. Just go do it. Those who have the right approach certainly do seem to recover more gold and make the exciting strikes! You’ll have fun and the gold you get will be a bonus! Well, Norma is looking out our trailer window towards our mining area. Excuse me, but I have to fix some sandwiches.